Holly & Percie are back again! Exciting weekend for Percival, as he was reunited with his mum! Holly, Percie and Ruby went for a walk together at Ampthill Park (lovely place to take dogs or just go for a stroll) and got on really well. Percie definitely takes after his mum looks wise, albeit he's a slightly chunkier version. She also loves a frisbee! I got an email during the week asking if I could recommend any particular type of dog food. I'm no vet, or pet nutritionist, but I can tell you what they eat - and they got a clean bill of health from the vets. They both have dry biscuits, twice a day, along with some scraps of our food (mainly veg) if they are lucky. It's really important not to overfeed your dogs, as their health can really suffer. Dogs don't particularly like human food, but they'll eat it if it's given to them. And never feed them chocolate. Ever. I've just entered both of them in a great online competition. All Dogs Matter are running a competition to find Britain's Cutest Staffy with all donations given by entrants and supporters of the charity going to abandoned staffies. I may be bias but I think H&P have a good chance. I used these photos of my gorgeous girl and handsome boy, but you get to upload as many as you like so no doubt I'll pop some more up to hopefully win the attention of the judges. 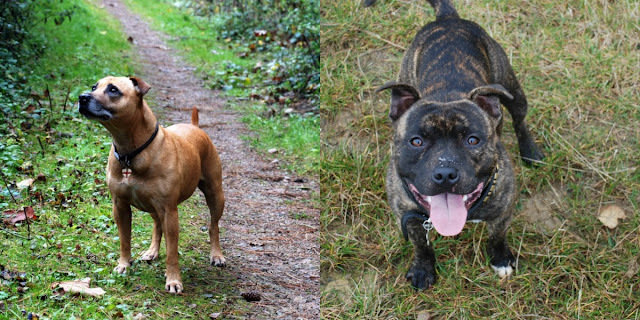 I have two staffs myself there such loving dogs! Ive always had staffs I hate the stereotype I get when I tell people I have two staffs! Ive done a post on my dogs if you want to have a look.